Our Hometown Hero of the week is Jeremy Strickland a 911 dispatcher for the Town of Wake Forest. Jeremy was nominated by Julia Strickland who shared: Jeremy has been dedicated to public service since the day I met him. 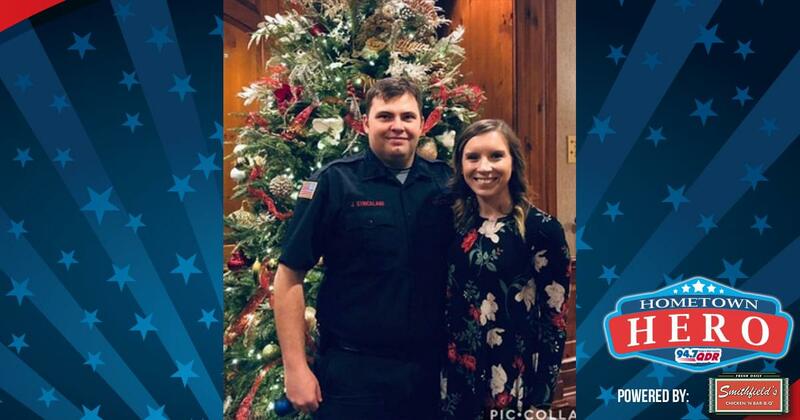 Since he was in high school, Jeremy has been a part of his community fire department. He now works diligently as a 911 dispatcher for the Town of Wake Forest. When off duty he is usually pulling duty crew as a volunteer for Wake Forest Fire Department. Jeremy is dedicated and cares about the community he lives in. He goes above and beyond to ensure everyone he comes in contact with is okay. He is the definition of a hard worker. Thank you Jeremy for your service! We’re sending you a gift card to Smithfield’s Chicken ‘N Bar-B-Q to thank you for all you do!